If you’re a fan of college football, you prolly know National Signing Day is right around the corner. The days leading up til the first Wednesday in February are very exciting. Until you actually sign a National Letter of Intent to play a sport at a college, you have merely made a verbal commitment. This year has been interesting for college football. Two of the nation’s top high school players have made decisions putting their MOMS in the news. 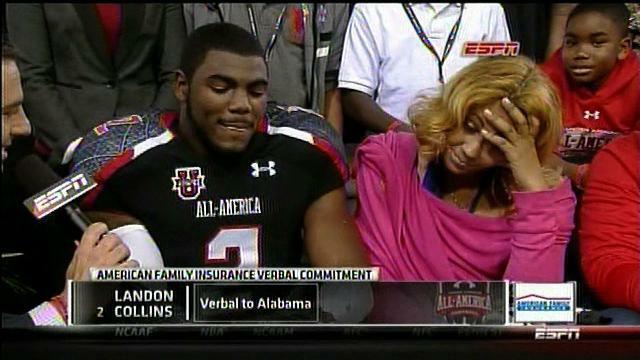 We’ve seen the excitement of high school star safety, Landon Collins verbally committing to a school against his mother’s approval. Now, college football is talking about Gunner Kiel and his mom. The nation’s top QB originally committed to his home state school, Indiana. After a visit to LSU, he changed his mind and verbally committed to the mighty LSU Tigers. 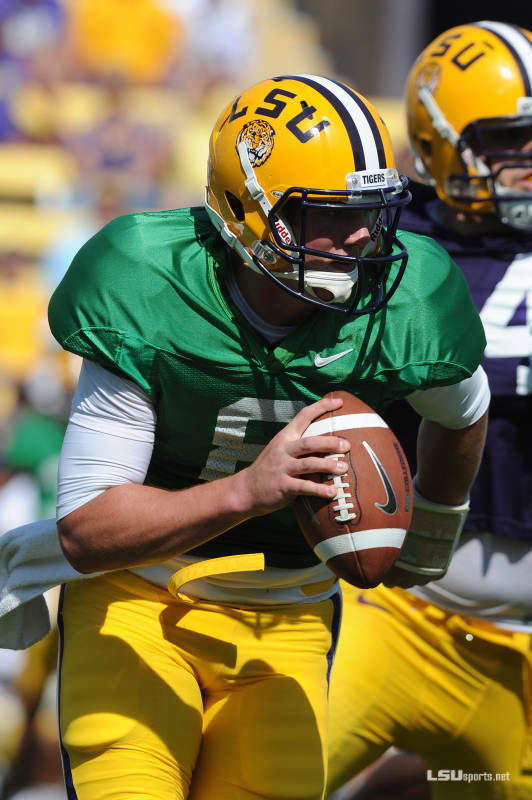 However, it is being reported that Gunner will not be playing ball at LSU. He will be attending Notre Dame. “He wants to come to LSU, but his mother (Aleta Kiel) got very emotional Monday and did not want her son to leave. He plans to enroll in classes at Notre Dame on Tuesday. Ok moms, I get it…we love our boys. I love LSU and SEC football, but I’ve always said I wouldn’t want my sons to play football in college because I couldn’t watch them get hurt. Yes, selfish and worrisome, I know. I’m a mom. That’s what we do. I am a mom first and a sports fan second. However, if they choose to play football or any sport, I’ve made a verbal commitment to step back and allow them to make their own choices despite my personal feelings. No guilt trips,bad attitude, passive aggressive comments, silent treatment…just love and support for their decision. Afterall, isn’t this what we spend 18 years trying to teach our children? We raise them and instill values and beliefs in them hoping to make them fine young men. Then we send them out into the world, let them grow on their own, and learn from their choices? As moms, we should support our children and their decisions. It’s a part of life. THEIR life. They are choosing a COLLEGE, not a CRIME. It’s not about us. We have lived our life. As our boys grow, our role in their life will change. Going off to college is part of the process of these high school boys growing into men. So what if you don’t like it…it’s your child’s choice, life, and dream. As a LSU fan, I was disappointed to hear Gunner would not be a Tiger (P.S the name Gunner Kiel ROCKS!). But I understand. He’s a 18 year old kid. Kids change their mind. This is one of the biggest decisions he will make in his life. He has to do what’s best for himself. (Plus LSU has one of my faaaave quarterbacks, Zack Mettenberger. Can’t wait to see him play! We also have 3 other QBs: Stephen Rivers, Jared Foster, and Jerrard Randle. 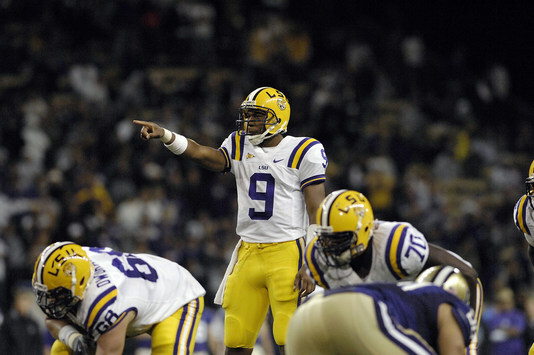 Don’t worry Tiger fans, LSU will be fine in the QB department). Asking questions are really pleasant thing if you are not understanding anything fully, however this paragraph presents pleasant understanding yet.